AM:PM is a thriving bar/bistro located in the heart of Belfast. AM:PM has established itself as one of the hottest venues in Belfast. With a capacity for 60 people, "intimate" and "exclusive" are just two words used to describe this venue. The interior of am:pm is dominated by various pieces of minimalist stainless steel decoration, yet it still manages to evoke a feeling of warmth and comfort. This contemporary mindset is extended throughout the food menu, and indeed the music policy. Serving food throughout the day to shoppers and business people alike, in the evening am:pm transforms into a hip hangout to unwind and chill-out to a soundtrack of everything from Deep House to 50s Swing. Have you got Google Earth on your computer? If so, then download the Google Earth view of AMPM. Is this the wrong position for AMPM? If you think so, then modify its position. Click / Tap the button above to get directions from where you are to AMPM. We booked a table for 5 originally and on the day of the booking were able to change both the number of covers and the booking time. Nothing was too much trouble. I can report that all the meals looked fantastic but having chosen the goats cheese starter and the chorizo pasta main I was thrilled with the quality of the food. So pleased was I with the meal and wine that I updated my Facebook status to sing the praises of am:pm – a restaurant I have overlooked previously! As well as delicious food the surroundings are modern but inviting, it is somewhere I could happily sit all evening, even the background music was fantastic. I will definitely return with friends and we are considering planning another work night out here in the not too distant future. Special thanks to John for coordinating our visit and also to the two attentive waiters whose names I didn’t catch! Keep up the fantastic work. Gorgeous wee place to enjoy good house music and a good drink! I arranged my last Christmas party for my staff at this location. We where not disappointed! The waitress was very attentive and always on hand, polite and giving 100% service with a smile. I think her name was Emma? Not sure, small, black hair. The food was delicious, arriving at the same time on hot plates which takes a lot of organizing. I always recommend Am Pm to friends who visit Belfast because they never disappoint. I have been frequenting Am Pm for over six years and will continue to do so. Arrived to be told to hurry up and order. We felt pressured to order even though the rest of the group had not yet arrived. After ordering it took 55 minutes for the food to arrive. To give them credit, the food was good. As soon as we had finished the mains we were asked to leave as another group had arrived. Rude staff. Ended up stopping at KFC for an icecream for pudding. Bill was very expensive. Added to this there was a service charge of £10 for 3 people. We were not aware of this charge. Nice food, but I wont be back. My daughter Sarah had her 18th birthday party with you and it didn't dissapoint. The service, food, drinks and athmosphere was suburb and a great night was had by all! What a fantasic venue ! This place has really got its act together. Ambience, staff, food value i must say to my surprise totally top notch! Unquestionably thee best trinket of pleaseurrre in Belfast! I will and have been back on numerous occassions and it is getting better! I had high hopes for this place as I love the shabby chic style but we were very disappointed. Service was good but the food was poor. The toilets are more than shabby more dirty and generally neglected. A real shame, could be such a gem. 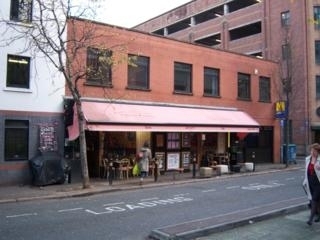 We have just come back from a weekend in Belfast and ate in this bistro last night. We were extremely dissapointed. The manager seemed uninterested and spent most of the time sitting outside texting whilst the food was a let down. In fairness it was very busy as there was a christening on however we felt like we were intruding and were not really wanted there. On arrival we were impressed with the decor and our order was taken quickly. We were then ignored for half an hour and on asking how much longer we were expected to wait the generic 'couple of minutes' answer was given with no apology, just an excuse about a large table being served first. The fish and chips arrived. 2 chips each. Albeit large chips. Still 2 chips. We were informed it was enough and that no one asks for more. She was correct, I could only manage 1 of the waterlogged offerings. Combined with overcooked fish, dried out peas, a generous helping of indifference from staff and filthy toilets, it was a very unsatisfactory experience. living between spain and ni, olivia and i both agree that the food, staff and atmosphere in arthur street could not have been better, we only called in for a drink, had more than, ate fabulous food, drank quality wine, left happy and smiling, perfect, laid back, friendly and professional, 5*****, we cant wait to get back, thankyou. o i thanks for the bucket! THEE BEST PLACE IVE BEEN TO IN YEARS!!! DECOR FOOD AND THE BEST STAFF! SO KNOWLEDABLE!! I booked a party for my Daughters 21st birthday but before I called to pay the deposit they had accepted a deposit from another party so it was too bad for me and my daughter. A very pleasant dining experience I must say, food was to a very high standard and very helpful staff who did not interupt but always managed to ensure you were well taken care of, I brought some business associates and will select this venue again. We arrived Saturday 16th Feb just before 8pm and were told the wait would be 45min so we took a seat at the bar. Two hours later we were shown to our table. I ordered the fish cakes to start and my partner mussles. When the fish cakes arrived they were frozen solid in the middle, and on sending them back the took my partners starter "to keep it warm" when the startes returned my fish cakes were soggy and the mussles were cold, clearly they had not been kept warm. For mains the frites steak was ordered with side salad, and the seabass with rosito. The salad was wilted with no crunch to the leaves and the rosito was more like rice pudding. All in all the entire meal was disgusting, infact the worst we have ever experienced. The staff did how ever remove the fish cakes from the bill. If as much effort went into the cooking as it did on the appearence i.e. the brass pots and mugs of chips im sure the food would be excellent, however we couldn't help but feel all this presentation was there simply to draw attention from the complete rubbish the was being served. great nite out, good food and good staff and didnt feel rushed which is a plus. they also have a heated smoking area so as not to make us nicotine lovers feel like outcasts and lepers. Initial thought was just another flash in the pan ( pardon the pun) but delicious consistent food and good service makes this one of the best in town. Just awful, waited 30 minutes for lunchtime food (There is a lunchtime 'beat the clock' policy where it is claimed you dont have to pay for food if you wait more than 15 minutes). This was politely brought to the attention of a friendly male waiter who 10 minutes later sent out an incredibly rude female member of staff, who very loudly and extremely rudely argued we only waited 15 minutes. We of course paid, but the service was complete rubbish. Dont make a claim of 15 minute service when it clearly cannot be honoured. Very rude, unprofessional staff. Avoid, please, if you want quality service, dont eat here. went there saturday night for the first,botanic that is,food was fantastic,the place was full and the service was 1st class,definately our new haunt,excellent atmosphere. This place deserves all the praise it can get. Frequent both regularly and have never had a bad experience. Great grub and great friendly staff. Waited at lunchtime for over 30 minutes for food - left when nothing had arrived. The manager mumbled something about a "problem with the printer"! Can't comment on the food - if you have 3 hours for lunch you might actually get to taste some of it - I won't be back. Class, comfortable and very reasonable. Been to Botanic venue as well. Both Very consistent and welcoming. Good job! I eat in both venues regularly and have to say without a doubt these places have the best steaks in belfast. Go to both AMPM's on a regular basis. Food is excellent. Great cocktails in Botanic! Great food, great craic excellent service and not a Henry Loyd or dodgy gold necklace in site. Best Birthday party I have been to. Toilets are a little small but I havent a bad word to say about the place. First impressions were not brilliant but I must admit I have been back three or four times with friends and the service, food and interior are excellent. Try the Beat the Clock menu, there is no better value in belfast! I am a regular visitor to both AM PM's and i must say for ambience decor, service, atmosphere and food it is in my opinion the best all round belfast has to offer. Yes for a more upmarket gastro experience maybe cayenne or james street south hit the mark but for a total all round package and value for money id recomend ampm with confidence! I visted AM:PM and found the experience to be very poor. The service was pathetic and the staff obviously wanted to be somewhere else. Have been to both AM:PMs restaurants on a number of occassions (though not through choice). Food is average at best & the service. Well the less said the better! I went there just after it opened and although the food was delicious, the service left a lot to be desired. We were at the bar ordering drinks when a senior member of staff stopped our barman from serving us so he could serve someone else. Once we got our meals, they never bothered with us again and we couldn't get a drink brought to the table. Also, it took them 45 minutes to bring us our bill. Although I loved the food, I haven't been back since because of the service. I have been to AM:PM several times and never been disappointed. The staff are super, the food very enjoyable and the atmosphere lush. If you are looking for somewhere intimate and relaxing you would be hard pushed to find anywhere better. Weeknights or weekends, it's been a joy to go to. There is no non-smoking section, service was good, food was excellent apart from the people who were smoking at each side of us as we ate our meal.